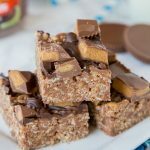 Peanut Butter Rice Krispie Treats – Classic rice krispie treats turned up a notch with lots of peanut butter, peanut butter fudge, and peanut butter cups! 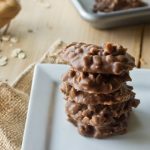 No bake, super easy, and over the top amazing! I love easy dessert recipes. And often times no bake desserts are easy to make. 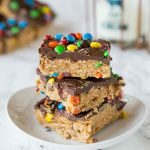 Classic rice krispie treats are pretty much the easiest dessert you can make, they are ready in 5 minutes and everyone loves them. But sometimes you want a little something more. 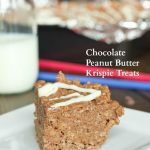 Years ago I made Peanut Butter Lover’s Krispie Treats and they are still one of my favorites. I am a sucker for anything with peanut butter and chocolate. 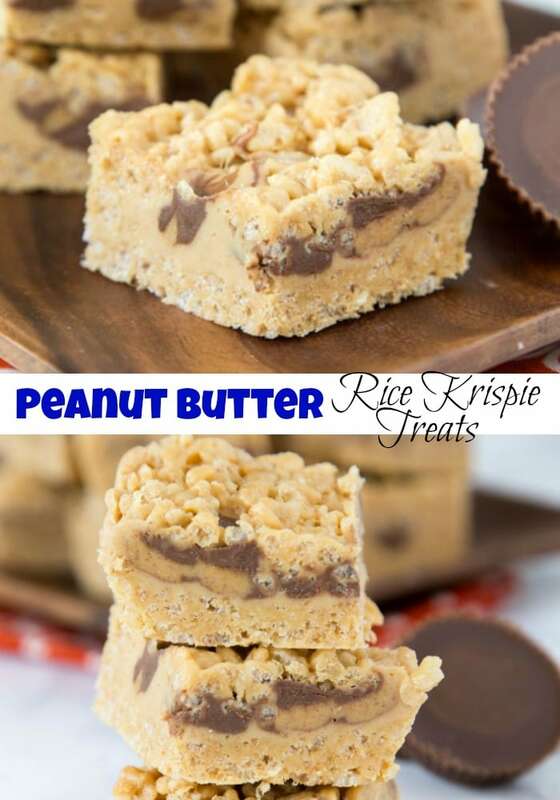 I am also all for rice krispie treats variations, so adding more peanut butter, putting a layer of microwave peanut butter fudge, and peanut butter cups sounds like heaven to me. 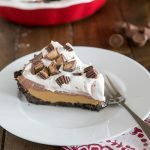 Peanut butter cup desserts are probably some of my favorite. 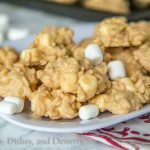 Basic rice krispie treats are easy! I like to change up the amounts on the box a little, but all you do is melt the butter and the marshmallows together. Then mix in the cereal. Once it is all gooey and mixed together, you press it into the pan. The hardest part is probably getting it not to stick to the spatula so you can press it in the pan. Using some non stick spray is a good trick to help there. 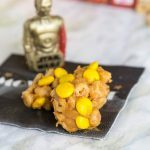 These peanut butter rice krispie treats have an added step of mixing in peanut butter with the actual cereal mixture. 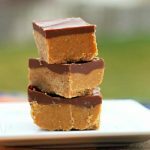 Then you also make a quick and easy microwave peanut butter fudge that gets put in between the layers. Lots of peanut butter cups are sprinkled in the middle as well. So a couple extra steps are involved, but they are what make these extra special. They are simple! The classic version just needs butter, marshmallows and rice krispie cereal. 3 ingredients combine for one delicious treat! 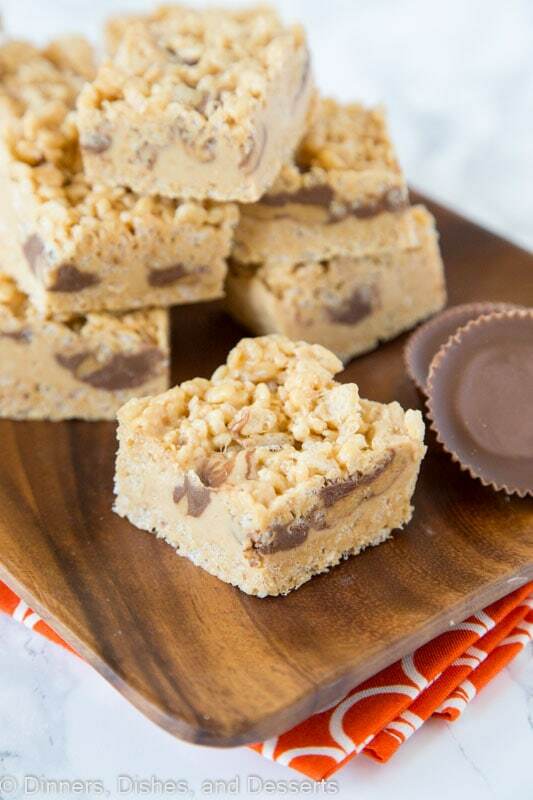 This rice krispie treats variations also uses peanut butter and peanut butter cups. The peanut butter fudge layer is just butter, powdered sugar, peanut butter, and vanilla. 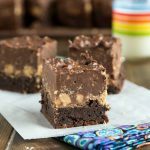 The peanut butter fudge in the middle makes these totally different that normal, and you will absolutely love them! It will be hard to go back to normal rice krispie treats again! Do you like cookie butter or Biscoff spread? 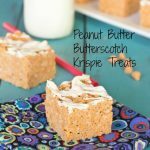 Then you will love this other rice krispie treats variations – Biscoff Rice Krispie Treats. 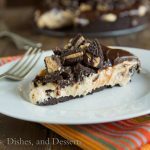 It is topped with a chocolate and has tons of Biscoff mixed in. So good! And a great substitute if you have any peanut allergies you are working with. 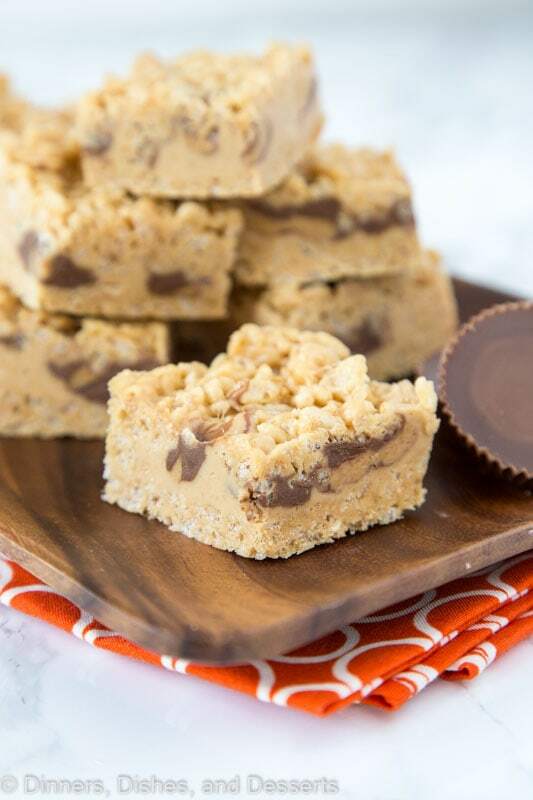 The next time you are looking for an easy no bake dessert to make, look no further than these Peanut Butter Rice Krispie Treats. 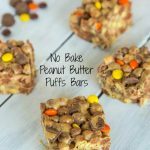 If you like peanut butter, you are going to love these! They are down right addicting, and everyone loves them. 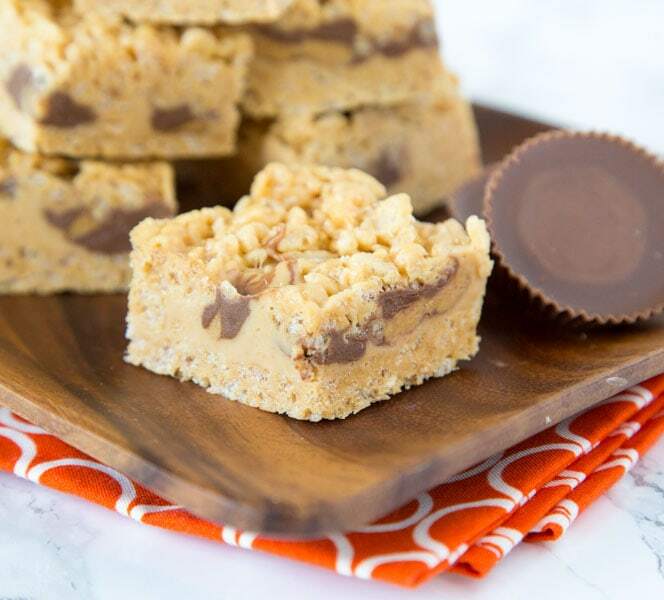 Peanut Butter Rice Krispie Treats - Classic rice krispie treats turned up a notch with lots of peanut butter, peanut butter fudge, and peanut butter cups! No bake, super easy, and over the top amazing! 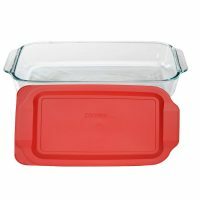 Spray a 9x13 inch baking dish with non-stick spray. Set aside. In a large bowl heat butter, peanut butter, and marshmallows together for 1 minute. Stir until everything is melted and combined. Pour in cereal and mix until everything is well coated. Press half of the mixture into the prepared pan. In a large microwave safe bowl combine the butter and peanut butter. Cover with plastic wrap. Microwave for 2 minutes on high. Stir and microwave on high for 2 more minutes. Be careful when you remove from the microwave, it is very hot. Add the vanilla and powdered sugar and stir to combine. Spread over the 1st layer. Sprinkle the mini peanut butter cups over the fudge, lightly pressing down. Press the remaining cereal mixture over the peanut butter cups, gently spreading and pressing down. Place in the fridge for 30-60 minute until the fudge and peanut butter cups are completely set. Everything about these is making me happy! I want this! These look amazing!! I’m eating keto right now and I want to cry that I can’t make them. Saving for a cheat day! This is such a great dessert! PB cups in the middle of this classic treat? Oh, yes, please! Love the addition! I have such a sweet tooth right now – I need these!!! I made a similar recipe to this before but this is even better! Currently craving this deliciousness! Get in my belly! We are crazy about rice krispie treats! These are amazing! These are such an easy dessert everyone will love! They look crazy good!! It’s like you took rice krispie treats and made them even better. And peanut butter? I’m in love. the classics are the best!! Best rice krispie treat ever! Love that peanut butter! These are really perfect treats! Kids will surely enjoy these!